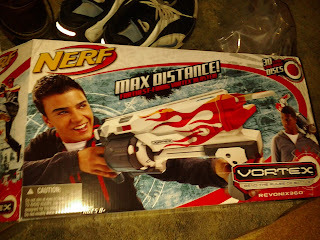 Next, we have what appears to be the top blaster of this generation - the Sneak Attack. For those of you interested, it's the exact same concept as the Nerf Sneak Shot - you use a plastic mirror to aim the blaster around a corner when you have it at a 90 degree angle. 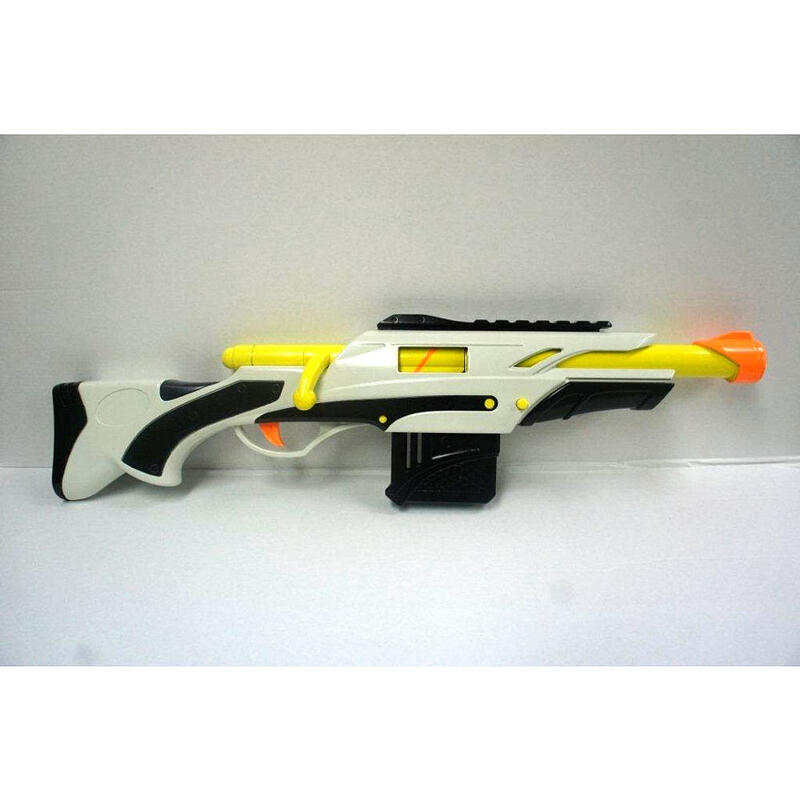 There isn't really a way to lock the position, aside from the plastic clip for locking into the normal, straight firing position. The z90 is the newest addition to the Splatmaster line of .50 cal paintball markers. This series is marketed as a gateway into the world of paintball, with smaller paintballs and lower (though respectable) performance due to the manual nature of launching the balls. No CO2 here. 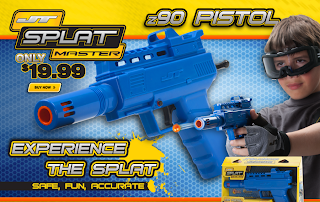 While there is already a pistol in the series (the z100, with its removable magazine), JT had a different idea with this blaster - paintballs load from the top, and can be pushed into the ammo slot one at a time. 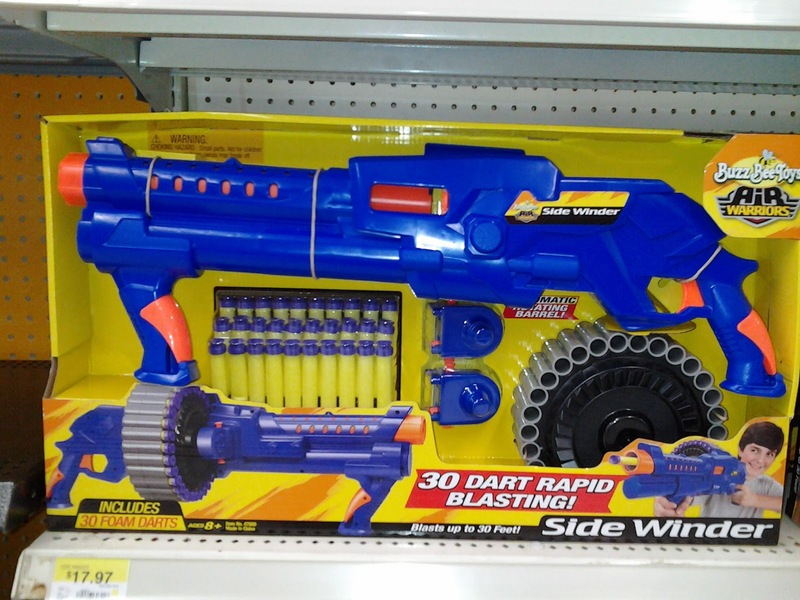 Being .50 caliber and spring-powered, these markers are a natural choice for conversion into Nerf-type blasters. More pics and thoughts after the jump! 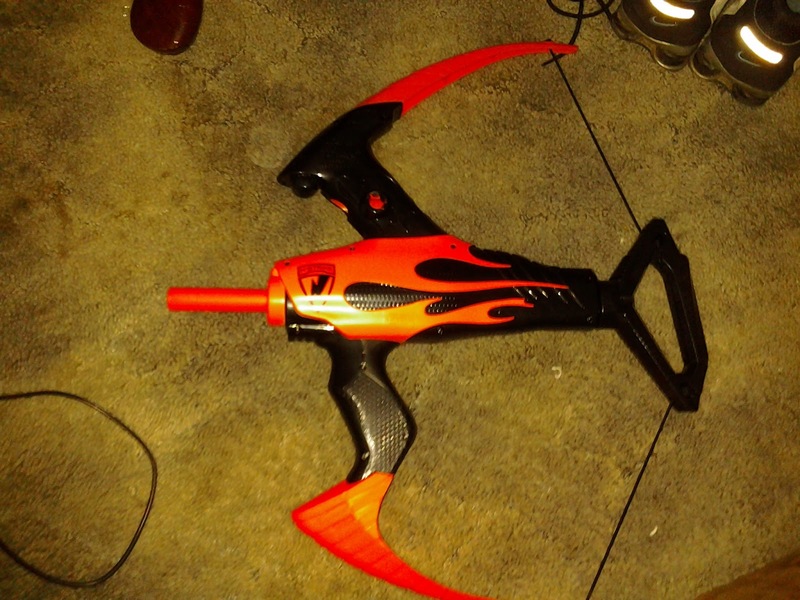 The other Nerf bow out this fall, along with the Heartbreaker Bow, is the Blazin Bow. Packaged as simply an Nstrike blaster (not Elite), it fires foam arrows instead of darts. The box claims up to 40 feet, which can be done at an angle. But there's potential underneath the shell, if you're willing to overcome a few obstacles. Read more on basic mods and performance after the jump. 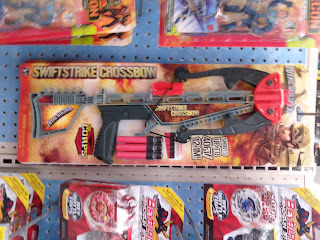 I expected to find this unusual crossbow at some point under the "Huntsman" branding, but while wandering the toy section at Walmart, I found it with other "The Corps!" toys. For $10. Why not buy it for science? See more pics after the jump, folks! 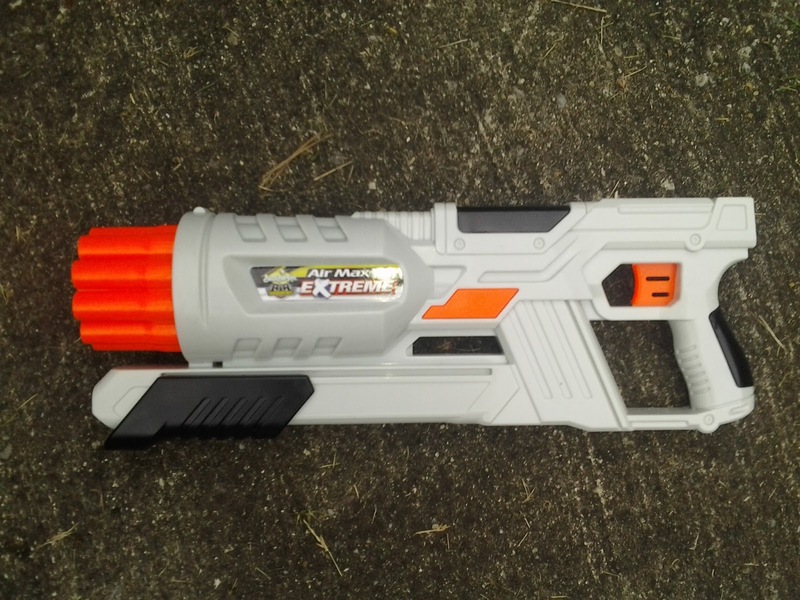 Toys R Us - X-Shot Vigilante repaint and Buzz Bee Hawk update! I have a large number of posts to make - had less work this week, and found/modded SO MANY THINGS. But I'll start with a little update, as seen on TRU's website. 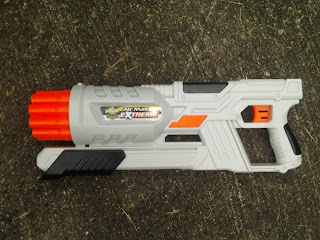 The Air Zone Quickfire Eaglet Impact X (a mouthful, isn't it?) appears to be a remodeled Buzz Bee Hawk, with a more milisim-style shell. I actually like this better than the Hawk, but I doubt there will be any kind of performance increase. Meanwhile, the Air Zone Vigilante is also up, but without an image. Based on the price, however, it would be safe to assume it's a repaint of the X-Shot Vigilante, which hasn't really been seen stateside. 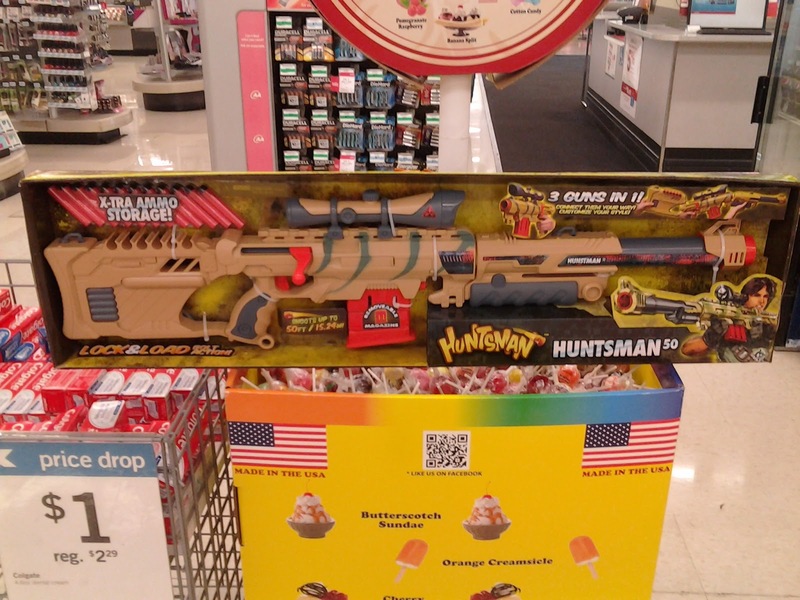 While it wasn't supposed to be out this early, Kmart (who already jumped the gun on the Tek Recon release) has placed the Huntsman 50 on shelves, making this the first new Lanard blaster in quite a while (Air Zone versions have appeared at Toys R Us, but those were all repaints of existing blasters). Naturally, seeing how no one else seems to have it, I bought it and took it home for review. Read on! 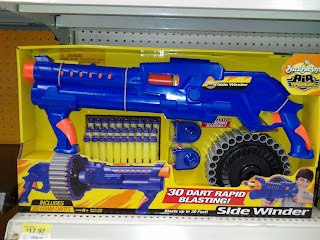 I've been keeping an eye out for this Lanard series of blasters - many popped up on Meijer's website, but have since disappeared. 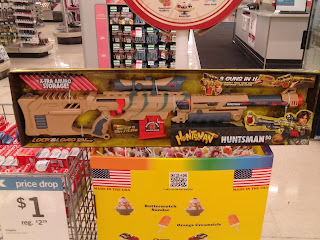 Now, however, the blaster line is on Kmart's website, including a complete sniper rifle with 50 ft. ranges. Hey guys! I'm back from a weekend in Michigan at a friend's wedding. 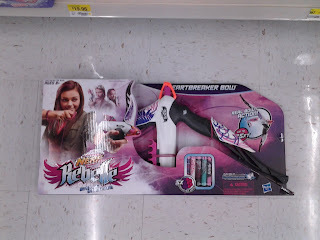 During the long drives, however, I stopped to check the local Nerf supplies, and was nicely surprised! Target mistakes for the win!